The American Express blue cash card is one of the best credit cards to use for your moving expenses because of it’s cash back program and it’s services that can make the details of moving easier. The cashback you earn on the money you spend for moving expenses won’t be spectacular but it will help you move more quickly into the highest cash rewards tier. Moving expenses can definitely add up: buying boxes and shipping materials, renting moving trucks, hiring movers, cleaning out or repairing your new or old home, paying for gas, paying deposits, etc. Of course there are things you can do to reduce your moving costs but it’s still an expensive life event. American Express occassionally teams up with other companies to offer you a discount if you pay with one of their credit cards. For example, if you use your Blue Cash card to rent a truck from Budget through their website for the next two months, they’ll give you 15% off the cost of the rental. When you move to a new place you’ll be spending money at new businesses and with new service providers. You can use reviews and referrals to help figure out which ones you can trust to hire or buy from during and after the move but you still might end up having a bad experience with a business. One of the families I know that moved recently had some issues with their moving company and is still working to dispute charges that were put on thier credit card bill. If you’re billed by such a merchant for something you don’t feel you owe, American Express makes it easy to raise a red flag. Of course most credit cards have the ability to dispute charges but American Express makes it easy to initiate. Your online records have a button where you can open an inquiry and their interactive services team will walk you through the steps necessary. If you need to keep track of all moving expenses for budgeting reaons or if you need to submit a portion of the costs to your employer for reimbursement then the online statement that Amex provides is very helpful. 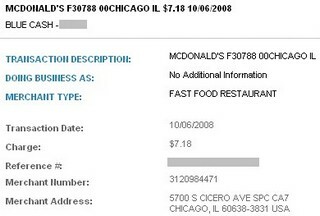 Here is an example of the detail for one of the charges I made recently on a business trip to Chicago. This is an expense my company will reimburse me for but I couldn’t find the reciept anywhere once I returned home. The good news is that my online credit card statement provided more than enough information for me to submit it on my expense report. Moving can be a tedious and expensive process so we all look for ways to cut the cost and stress of the event. The American Express Blue Cash card can help with cash back rewards, discounts on moving, disputing charges, and managing your expense reciepts. Of course not all businesses accept American Express cards so it’s helpful to carry a cash back visa card and some extra cash when moving as well. Here is the URL for the offer from Budget Truck you can save a lot on your one way move! I love to have one!